Argent’s legacy ERP system was cumbersome, costly, and disruptive to the business just to keep it current. Achieved nearly 100% on-time deliver rates and 98% inventory accuracy. 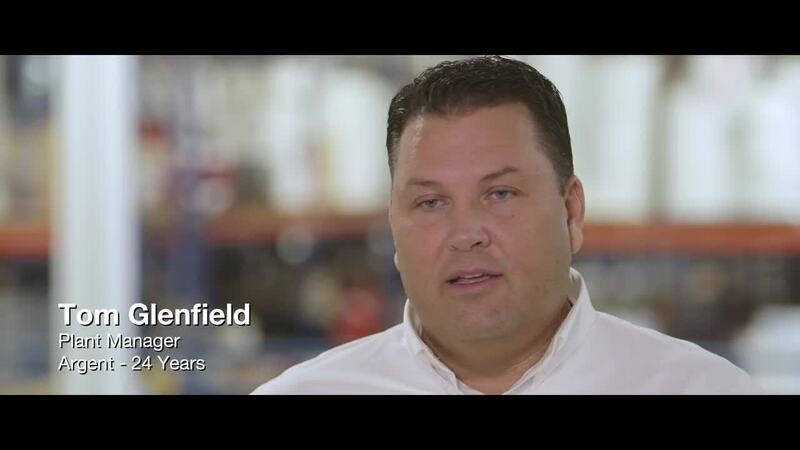 The company chose the Plex Manufacturing Cloud to lower costs and for comprehensive quality compliance. With Plex alerts, Argent is able to reduce machine set-up and downtime. Argent International is a 3M Preferred Converter. For more than 40 years, the company has specialized in the fabrication and distribution of unique adhesive and die-cut solutions. But Argent is more than just a tape converter—the company’s engineers are problem-solvers who are always ready to develop custom solutions for any scenario. Argent manufactures more than 20 million individual parts per month with 350 unique part numbers, and can produce unlimited part configurations. End users found the company’s existing ERP system cumbersome. Each ERP upgrade introduced changes that were disruptive to business processes. In-house ERP installation put a strain on the company’s IT budget and manhours. Manual inventory processes were time-consuming and error-prone. Lack of visibility into capacity and inventory led to scheduling problems that caused too many missed delivery dates. Achieved nearly 100% on-time delivery rates. Eliminated $60,000 of annual expenses in ERP maintenance, upgrades and licensing. Boosted inventory accuracy to 98%. Supported 20% sales growth with fewer employees. Reduced machine set-up time and downtime. Despite producing 20 million parts per month, Argent International competes on quality, not quantity. The company is TS 16949 and ISO 14001 certified, and makes quality its top priority throughout its great diversity of products that range from simple die-cut tapes, seals, and gaskets to fully assembled subcomponents. Argent used to track its operations in an ERP system from QAD. But the company’s end users found the system cumbersome—and its decision-makers grew concerned about the costs associated with the system. When Argent International began researching manufacturing solutions for a possible upgrade, the Plex Manufacturing Cloud stood out because its cloud delivery model helps eliminate hardware costs. There were other potential benefits just as important. Today, every Argent International employee has a Plex username and password. Upgrades to the system happen seamlessly. And Argent has eliminated the $60,000 per year it was spending on maintenance, upgrades, and licenses for its QAD system—not to mention the never-ending need to buy more powerful hardware. As Argent’s decision-makers decide how best to steer the business, they can easily get the data they need from Plex. In contrast to the company’s previous system, the Plex Manufacturing Cloud serves up business data in a variety of intuitive views. Having easy access to business data in Plex supports Argent’s open-book management philosophy, in which each employee is taught how they can contribute to business performance and then expected to deliver. Plex serves up the data that helps employees understand how they’re contributing to the bottom line. Plex reports even help Argent streamline quality audits. When third-party auditors come in to review the company’s operations, Plex is their first stop. With such a high volume of parts produced each month, Argent must keep track of millions of pieces of inventory—both raw materials and finished products. The cycle count feature in Plex enables Argent to make highly accurate inventory counts without any of the manual data entry that the company’s previous system required. Leaders use Bluetooth scanners to count finished inventory. Once the right inventory is available, Argent uses Plex to ensure that the manufacturing process will run as smoothly as possible. Planners use the system to release orders to the shop floor. Every work center has a computer, where operators can view and update information. As kitting teams prepare raw materials, everything is scanned into the system. Argent’s leadership can check in at any point in the manufacturing process to see how jobs are progressing and how much time is left. In an effort to keep machines running optimally, Argent recently implemented Andon lights to alert maintenance staff to problems. The strategy has paid dividends. If an operator on the shop floor is in setup or downtime for longer than 20 minutes, an Andon light will begin flashing. If the disruption lasts more than 45 minutes, the Plex system sends out text messages and emails. Since implementing Plex, Argent’s sales have continued to increase. But thanks to the efficiency the new system brings, Argent hasn’t needed to add headcount. In fact, its purchasing staff has shrunk from three to two, even as the company manages $12 million of product and achieves nearly 100 percent on-time delivery rates. By serving up real-time data to anybody who needs it, Plex enables Argent to run an even leaner operation. For example, the company has reduced its scrap rates significantly since 2011. With data at the fingertips of decision-makers, the Argent team can stop being reactive and start planning ahead to meet customers’ needs. Instead of building products a day or two before shipping, Argent routinely builds seven days ahead of a customer’s due date. This not only gives the company the flexibility to change the schedule to fill a rush order, but also allows the company to carry a smaller inventory of finished products. Even before implementing Plex, Argent had a reputation for being able to get parts to a plant within hours. Plex has given the company the visibility to not only keep filling rush orders, but also meet more of its regularly scheduled deadlines.